Was Darth Vader Not Originally Luke Skywalker's Father in 'Empire Strikes Back'? "Owen, you must hide this baby, at all costs, from Anakin Skywalker." "Okay. Should we continue to call him Luke Skywalker?" The reason that that plot point did not make sense was because originally Anakin Skywalker was not Darth Vader. It is fairly well known among even casual Star Wars fans that George Lucas' original plans for "The Star Wars" were drastically different from what made it into the first film. However, as it turns out, there were still drastic changes to be made in Lucas' plans for the films even after the first film, all the way up through the original screenplay for The Empire Strikes Back. While I am sure there are other couples who could challenge them, Edmond Hamilton and Leigh Brackett are likely the most accomplished married couple in the history of science fiction literature. Hamilton was one of the earliest adopters of the science fiction genre in the pulps during the 1920s and 1930s. He popularized the famous pulp fiction science hero Captain Future (although he did not actually create the character) and also worked on a number of notable comic books later in his life, including being the primary developer of Jerry Siegel's creation, the Legion of Super-Heroes. Brackett started working in science fiction during the 1940s (she married Hamilton in 1946) and after taking a break to become a Hollywood screenwriter during the mid-1940s (her most famous work from this time was the complicated crime thriller The Big Sleep - a film so complicated that there is even an urban legend about Brackett and her fellow screwnwriters not understanding the plot of the film themselves) she returned to science fiction full-time in 1949. She would still work on films after 1949 (including such notable works as 1959's Rio Bravo, 1967's El Dorado, 1970's Rio Lobo - all three for Howard Hawks, who directed The Big Sleep and 1973's The Long Goodbye, a remake of The Big Sleep) but she devoted herself primarily to writing science fiction short stories and novels. Oddly enough, then, before George Lucas commissioned her to write the screenplay for the sequel to Star Wars in 1977, Brackett had never actually written a science fiction film. As I discussed in a Movie Legends Revealed about whether the Wampa attack in Empire Strikes Back was written into the film to address Mark Hamill's facial injuries, Lucas had a general plot outline for the Star Wars sequel in 1977. He discussed it with Brackett and then she went off and wrote her first draft of the screenplay for the film. She delivered it to Lucas in February of 1978. Tragically, it was the last piece of work Brackett ever did, as she was dying of cancer while working on the film and she succumbed to her illness soon after turning the first draft in to Lucas. Brackett's first draft is essentially the basic plot of Empire Strikes Back - the Battle of Hoth, Luke going off to train with an old Jedi master (although the Jedi master is named Minch in Brackett's screenplay), Han and Leia meeting up with Lando Calrissian, who then betrays them to Darth Vader, who wants them as bait to draw in Luke Skywalker. The major changes to Brackett's plot are that Han is not captured in Brackett's screenplay, Luke doesn't lose a hand, Luke does have a twin sister, but it might not be Leia and most importantly, not only is Vader not revealed to be Luke's father but Luke actually gets to meet his father, or at least a spirit of him, during his training at Dagobah (called Bog World in Brackett's screenplay). Skywalker: You've grown well, Luke, I'm proud of you. Did your uncle ever speak to you about your sister? Luke: My sister? I have a sister? But why didn't Uncle Owen? L: Where is she? What's her name? Darth: You're in love with Leia. You don't want to lose her to Han Solo... but you will, if you lack the courage to use the strength that's in you. A strength as great as mine, Luke. If you join with me, nothing can stand against us. D: The Empire is a passing phase. We would rule instead. You and I. The Emperor is a harsh master. You would not be. You could restore the peace, put a stop to the killing. How much good you could do, Luke! Don't be afraid. Reach out, grasp the stars. They're yours for the taking. You don't stand a chance against me... No more than your father did, anyway. So Luke find the strength to not only not kill Vader, but also to manage to escape without Vader killing him. Still, he knows that the Dark Side is there inside of him. As the film ends, Luke is a changed man but one ready for the next adventure. Lucas had a lot of problems with Brackett's screenplay, as it seems like her style and Lucas' just clashed in general. He wanted the ending to be a lot darker and for the heroes to be in a lot more danger at the end of the film. 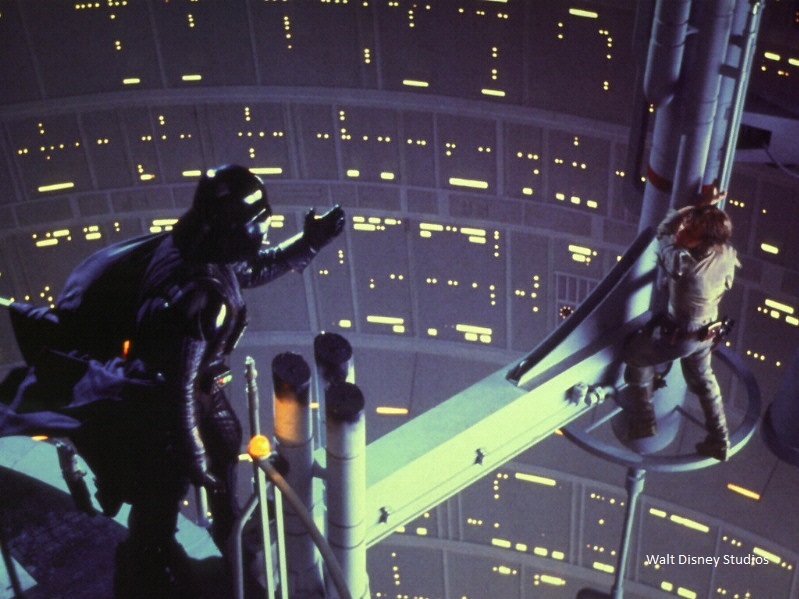 But in addition, he wanted to go over the idea of Vader and Luke's father with Brackett. However, as noted earlier, Brackett tragically died a month after handing in the screenplay, so Lucas was never able to have Brackett revise the screenplay (that is if he was ever even going to go that route -- I could easily see him replacing her on the project period) and instead Lucas had to come up with the new plot elements for the story himself. After revising the screenplay, Lucas then hired Lawrence Kasdan to polish up Lucas' revised draft (oddly enough, only Brackett and Kasdan are credited for the screenplay during the film and not Lucas). In this new version, obviously Darth Vader is revealed to be Luke's father. But we will never know whether Lucas would have gone that route if he still had Brackett to work on the script with him - a tantalizing Star Wars "What If?" Be sure to check out my archive of Movie Legends Revealed for more urban legends about the world of films. And click here for legends just about Star Wars!